With help from a friend, out of a pair of my mother inlaws old leather boots! It was time consuming but I also believe that could of been because I have three young son's who keep me quite busy. It was very inexpensive since I already have the acrylic paint and basic materials I need to create the perfect Harley Quinn boots, which made it worth it! I googled picture's of the shoes from the movie and screen shot them an used those as a guide. I did cutting, hot gluing, painting and relacing! The rest of the out fit i ordered online and or found at local shopping centers! 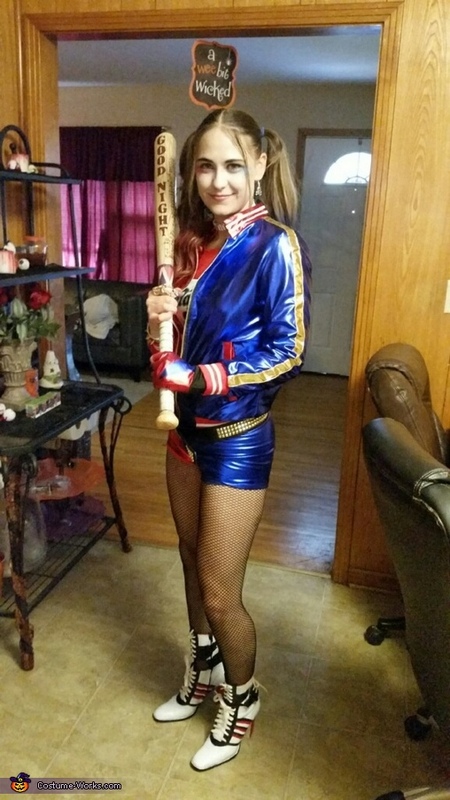 I did my make-up an hair using various kinds of Halloween make-up and regular make-up and temporary hair color (spray cans) and walla, the perfect Harley Quinn Halloween costume!